For jewelry and gifts as unique as you or your loved ones, visit Billy The Tree, online at BillyTheTree.com. Billy The Tree is the online source for a variety of high quality fashion jewelry, including magnetic bracelets, magnetic necklaces, sterling silver jewelry, copper bracelets, watches, jade jewelry, sunglasses, earrings, pearls, rings, a variety of stones, jade carvings, head wear, and more. BillyTheTree.com specializes in offering great prices on magnetic jewelry, popular for their therapy uses. Also Billy The Tree is the place to find sunglasses from names like Tifosi, Anarchy, Angel Eyewear, and Gargoyles. But before you shop, be sure to reap all the savings with the latest BillyTheTree.com discounts, Billy The Tree promotions, and Billy The Tree coupon codes found here at RetailSteal.com. BillyTheTree offers free shipping worldwide on most products. Consult site for more information. Enter this coupon code at Billy The Tree and save 10% on your purchase. Click link to shop now. Take 5% off your purchase at Billy The Tree using this coupon code. Shop today and save on magnetic bracelets, sunglasses, jade gifts, and more. 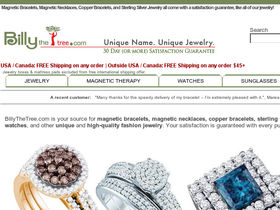 Save an extra 10% on magnetic jewelry when using this coupon at Billy The Tree. Click link to shop and save today. Save 10% on your purchase of $100 or more at BillyTheTree.com. Click link and use coupon code to save. Enjoy free worldwide shipping on all jewelry and most items found at Billy The Tree. Click here to shop and save on great gifts and jewelry today. Shop online at BillyTheTree.com to save up to 70% on a wide selection of magnetic bracelets. Click here to start! Save up to 50% or more on ancient Roman glass jewelry and styles at BillyTheTree.com. Click link to shop selection and save. Save up to 40% on unique and beautiful jade jewelry online at Billy The Tree. Click link to view selection and save. Shop for Tifosi Sunglasses at BillyTheTree.com and enjoy free shipping. Click here to view selection and save.